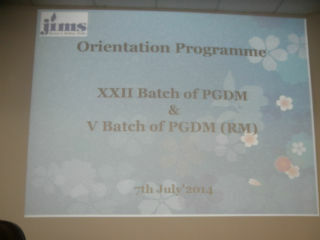 Jagan Institute of Management Studies, Sector 5, Rohini began its XXIInd batch of PGDM Program (Full Time) (2014-16) & Vth batch of PGDM Program (Retail Marketing Management) (2014-16) with fervor and enthusiasm on Monday 7th July, 2014. 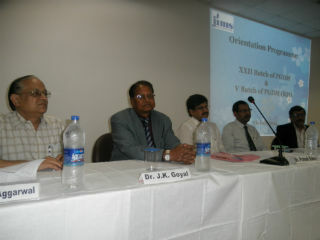 The Orientation Programme was an eloquent and most awaited affair for the students, parents and for the JIMS fraternity. It commenced in the name of almighty and by paying floral tribute to late Sh. Jagan Nath Gupta. Further Dr. Sumesh Raizada, Dean PGDM, enlightened the audience with his inspiring and motivational speech. 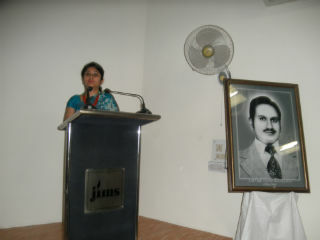 In his welcome speech he introduced the students to JIMS and gave a brief introduction of institute. He defined the philosophy of JIMS which is guided by (i) Trust and Confidence (ii) Transparency and Honesty and (iii) Perfection and Excellence. He stressed on promoting the culture of entrepreneurship with good communication skills, impressive personality and ability to take right decisions at the right moment. The students were briefed upon the need strategy wherein they should be goal oriented not task oriented. They should be work motivated not mere job seekers “The power of being focused and following the right approach is the success mantra”, he said. 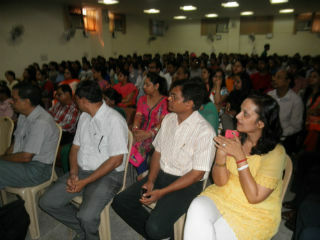 Further Director, Dr. J.K. Goyal, addressed the audiences with his charm and eloquence. His speeches have always enthralled students and this time it took the shape of entering into “Wedlock” with JIMS family. He underlined the idea behind choosing JIMS and undergoing the competitive selection procedure. He also mentioned the concept of ROI (Return on Investment) wherein the parent’s investment would be nurtured to the best. At the same time he stressed on the aspect of making business from the first day when they enter JIMS, where the students should be disciplined and be focus oriented. He also mentioned that successful placements records both at qualitative and quantitative aspects have taken place at JIMS even at the time of slow employability growth in the country. 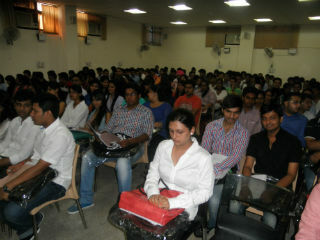 Director (I.T), Prof V.B Aggarwal also shared his thoughts and experiences with the audience. The key aspect of learning at JIMS under the flagship programme PGDM was highlighted. Working hard and achieving the goal was stressed. He stressed on practicing ethics and sincerity while using IT tools. Dean (IB) Dr. Ashok Bhagat presented the Vote of Thanks & shared his experiences with the 22nd Batch at JIMS. He also highlighted the importance of the programme and wished students a successful career and stay at JIMS. Later the students proceeded for their regular classes after a brief refreshment break. 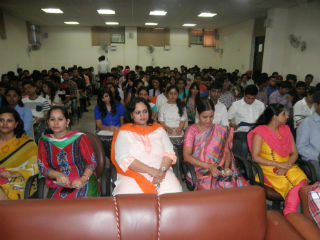 The whole programme was coordinated by Ms. Yukti Ahuja, Assistant Professor, JIMS.